Closing arguments were made this morning at the Jerry Sandusky trial, but more on that later. 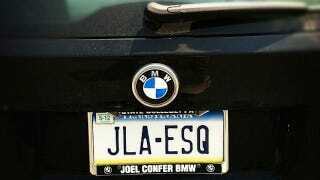 For now, let's all take a moment to marvel at this photo of the back of Lawyerin' Joe Amendola's BMW SUV, which not only has a vanity license plate, but an expired vehicle registration sticker ("5-12," or "May 2012") on the plate's the upper-left-hand corner. Quick! Someone call 1-800-REALITY!